A Raspberry Pi is a credit card-sized computer originally designed for education, inspired by the 1981 BBC Micro. Creator Eben Upton's goal was to create a low-cost device that would improve programming skills and hardware understanding at the pre-university level. But thanks to its small size and accessible price, it was quickly adopted by tinkerers, makers, and electronics enthusiasts for projects that require more than a basic microcontroller (such as Arduino devices). To learn more about the basics of the Raspberry Pi, watch this short video. Is the Raspberry Pi open hardware? The Raspberry Pi is open hardware, with the exception of the primary chip on the Raspberry Pi, the Broadcomm SoC (System on a Chip), which runs many of the main components of the board–CPU, graphics, memory, the USB controller, etc. Many of the projects made with a Raspberry Pi are open and well-documented as well and are things you can build and modify yourself. What are the differences in Raspberry Pi models? The Raspberry Pi Foundation has just recently released a new model, the Raspberry Pi 2, which supersedes some of the previous boards, although the older boards will still be produced as long as there is a demand for them. It is generally backwards compatible with previous versions of the board, so any tutorials or projects you see which were built for a previous version of the board should still work. There are a two Raspberry Pi models, the A and the B, named after the aforementioned BBC Micro, which was also released in a Model A and a Model B. The A comes with 256MB of RAM and one USB port. It is cheaper and uses less power than the B. The current model B comes with a second USB port, an ethernet port for connection to a network, and 512MB of RAM. The Raspberry Pi A and B boards been upgraded to the A+ and B+ respectively. These upgrades make minor improvements, such as an increased number of USB ports and improved power consumption, particularly in the B+. The A+ and B+ have been reviewed on Opensource.com here. What kind of operating system does the Raspberry Pi run? If you would like to experiment with multiple Linux distributions and aren't sure which one you want, or you just want an easier experience in case something goes wrong, try NOOBS, which stands for New Out Of Box Software. When you first boot from the SD card, you will be given a menu with multiple distributions (including Raspbian and Pidora) to choose from. If you decide to try a different one, or if something goes wrong with your system, you simply hold the Shift key at boot to return to this menu and start over. What are alternatives to the Raspberry Pi? The Raspberry Pi is not the only small computing device out there. In fact, there are many more options available than we could list here. We’ve reviewed some of the choices before, here, but let’s talk about some of the ones you may have heard of before. 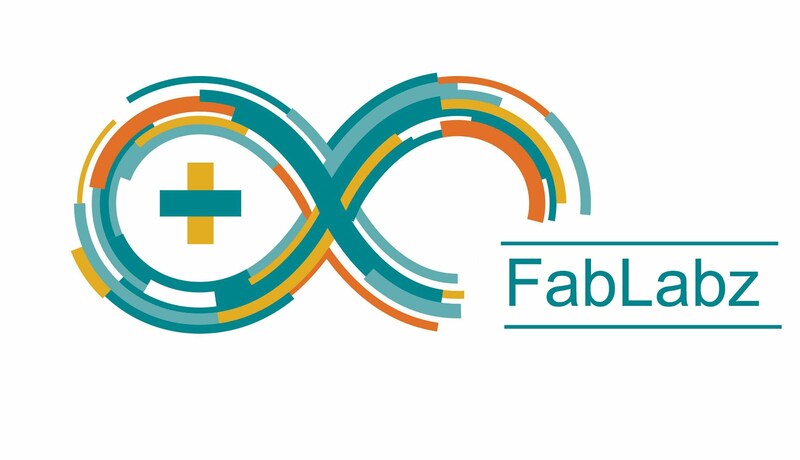 The Arduino is another hobbyist board, which is geared towards those wanting to build out electronics projects. But, while the Raspberry Pi is a fully functional Linux computer, the Arduino is only a microcontroller. This means it does not run an operating system, but instead, runs very specific, small blocks of code written by the person using the device. There are numerous add-on boards that give it more capabilities, but out of the box, it’s less ready-to-go than a Raspberry Pi. Another option is the Beaglebone series of boards, which are more similar to the Raspberry Pi, but a little bit more powerful (and a little bit more costly, too). One advantage of using the Raspberry Pi over some other alternatives is the size of the community. If you have a question regarding a project you are working on, there are a lot of people who might be able to help you because of the large reach of the community. What is the Raspberry Pi 3? The Raspberry Pi 3 Model B is the latest version of the $35 Raspberry Pi computer. The Pi isn't like your typical machine, in its cheapest form it doesn't have a case, and is simply a credit-card sized electronic board -- of the type you might find inside a PC or laptop but much smaller. What is the Raspberry Pi 3 capable of? A surprising amount. As you can see below you can use the Pi 3 as a budget desktop, media center, retro games console, or router for starters. However that is just the tip of the iceberg. There are hundreds of projects out there, where people have used the Pi to build tablets, laptops, phones, robots, smart mirrors, to take pictures on the edge of space, to run experiments on the International Space Station -- and that's without mentioning the wackier creations -- self-driving goldfish anyone? How do I get started with the Raspberry Pi 3? One thing to bear in mind is that the Pi by itself is just a bare board. You'll also need a power supply, a monitor or TV, leads to connect to the monitor--typically HDMI, and a mouse and keyboard. Once you've plugged in all the cables, the easiest way for new users to get up and running on the Pi is to download the NOOBS (New Out-Of-Box Software) installer. Once the download is complete, follow the instructions here and here and it will walk you through how to install an OS on the Pi. The installer makes it simple to set up various operating systems, although a good choice for first time users is the official OS Raspbian--although other operating systems are listed below. The look and feel of Raspbian should be familiar to any desktop computer user. The OS, which is constantly being improved, recently had a graphical overhaul, and includes an optimized web browser, an office suite, programming tools, educational games, and other software. How is the Raspberry Pi 3 different from its predecessors? The quad-core Raspberry Pi 3 is both faster and more capable than its predecessor, the Raspberry Pi 2. For those interested in benchmarks, the Pi 3's CPU--the board's main processor--has roughly 50-60 percent better performance in 32-bit mode than that of the Pi 2, and is 10x faster than the original single-core Raspberry Pi (based on a multi-threaded CPU benchmark in SysBench). Compared to the original Pi, real-world applications will see a performance increase of between 2.5x--for single-threaded applications--and more than 20x--when video playback is accelerated by the chip's NEON engine. Unlike its predecessor, the new board is capable of playing 1080p MP4 video at 60 frames per second (with a bitrate of about 5400Kbps), boosting the Pi's media center credentials. That's not to say, however, that all video will playback this smoothly, with performance dependent on the source video, the player used and bitrate. The Pi 3 also supports wireless internet out of the box, with built-in Wi-Fi and Bluetooth. The latest board can also boot directly from a USB-attached hard drive or pen drive, as well as supporting booting from a network-attached file system, using PXE, which is useful for remotely updating a Pi and for sharing an operating system image between multiple machines. Can I use the Raspberry Pi 3 as a desktop PC? The Pi can be run as a budget desktop, providing you have the patience. However, don't expect the Pi 3 to match a typical PC, it will lag loading heavier websites and, when browsing these demanding sites, having more than a handful of tabs open at once runs the risk of overloading the Pi's memory--causing a lengthy freeze. Can you use the Raspberry Pi 3 as your work PC? Can I work on a Raspberry Pi 3? You can but you'll likely find it wearing, due to everything from loading web pages to alt-tabbing between applications taking slightly longer than you're used to. Also, while I was able to run every application I needed, I mainly rely on web apps, and those who use more specialized local applications could find they're not supported on the Pi's predominantly Linux-based OSes. However, the Pi works well as a thin-client, as I found when I tested its capabilities when running as a thin client for Windows 10, with performance being almost indistinguishable from running a modern Windows 10 PC, save for the very slow transfer of data to USB sticks. Can I browse the web using the Raspberry Pi 3? Yes, the latest version of the Raspberry Pi's official OS has the Chromium browser, the open-source browser that Chrome is based on. It's performance is reasonable, as long as you don't open too many script-laden websites, and there are extensions that allow for smooth playback of video on YouTube and other sites. Can I use the Raspberry Pi 3 as a media center? Yes, there are various options if you want to use the Pi 3 as a media center but the most popular choices are the Kodi-based OSes OSMC or LibreElec. The Pi 3 has the added advantage of a slightly faster graphics processor, which the Raspberry Pi Foundation has said is able to play local H.264-encoded video recorded at 1920x1080 resolution and 60 frames per second. Another advantage is built-in support for Wi-Fi makes it easier to stream content to the Pi, while native Bluetooth simplifies the hooking up peripherals. Can the Raspberry Pi 3 run PS1, N64, SNES, NES and other classic console games? Yes, a wide range of vintage games will run on the Pi with the help of emulators like RetroPie, including some games from all of the systems listed above, although the more recent the system, the more likely it is that more demanding titles will struggle. Which operating systems can I run on the Pi? The Pi can run the official Raspbian OS, Ubuntu Mate, Snappy Ubuntu Core, the Kodi-based media centers OSMC and LibreElec, the non-Linux based Risc OS (one for fans of 1990s Acorn computers). It can also run Windows 10 IoT Core, which is very different to the desktop version of Windows, as mentioned below. However, these are just the officially recommended operating systems, and a large array of other weird and wonderful OSes also work on the Pi. Can the Raspberry Pi 3 run Windows 10? Yes, but it's nothing like the full desktop version of Windows 10 that most people are familiar with. Instead the Pi 3 runs Windows 10 IoT Core, a cutdown version of Windows 10 that doesn't boot into the graphical desktop and is designed to controlled via a command line interface on a remote computer. It can only run a single fullscreen Universal Windows Platform app at a time, for example a kiosk app for a retail store, although other software can run in the background. However, the Pi can act as a Windows 10 thin client, where Windows 10 is run on a server and streamed to the Pi and, with a powerful enough server, the experience can be virtually identical to running a Windows 10 machine. Can the Raspberry Pi 3 run Windows 10 desktop apps? The Pi 3 can run Windows desktop apps, although it requires you to buy the ExaGear Desktop software and spend some time setting it up. Performance is also poor, with the tools needed to run Windows apps on the Pi sucking up so much processing power that you're basically restricted to running 20-year-old Windows apps and games, and simple modern text editors. Basically, while it's technically possible, it's not something you'll probably want to do. Yes, Windows apps will run on the Raspberry Pi: But why would you bother? Can the Raspberry Pi 3 run Ubuntu? It can run Ubuntu with various desktops, with the Raspberry Pi Foundation highlighting Ubuntu Mate and Ubuntu Snappy Core as standouts. What are the Raspberry Pi 3's specs? How can I get the most from my Raspberry Pi 3? It's good advice to get a case to protect the Pi from damage, especially if you're going to be carrying the Pi around with you. If performance is important to you, you can also invest in a high-speed micro SD card, as outlined below. While the Pi can run a lot of different operating systems, if you're after stability and performance then the official Raspbian operating system is a good choice, having been tuned to get the most from the Pi, and bundling a fast web browser and a decent selection of office and programming software. If you didn't install the Raspbian OS using the Noobs installer, and you're running out of space, you can also go into the terminal and type 'sudo raspi-config' and then select the option to 'Expand root partition to fill SD card', which will ensure you're using all available space on the card. How can I get help with the Raspberry Pi 3? With more than 15 million boards sold since the first Pi launched in 2012, the board now boasts a strong community, which helps other users via the official Raspberry Pi site and forums. How do I keep the Raspberry Pi 3 up to date? If you're running the Pi's official Raspbian operating system then keeping the Pi up to date is relatively straightforward. Just open the terminal and type sudo apt-get update. Once the update is complete, then type sudo apt-get dist-upgrade. What is the power consumption of the Raspberry Pi 3? According to tests, the peak power consumption of the Pi 3 when under heavy load is about twice that of the Pi 2 (750mA vs 360mA), though for less-demanding workloads it should be broadly similar to earlier boards. What Raspberry Pi 3 kits are available? There's no shortage of Raspberry Pi kits available, that add everything from speech recognition, to robotic arms to build-it yourself laptops for kids to virtual assistants to the $35 board. Due to the success of the Pi, if you've got an idea for a project, there's probably a kit out there to suit your needs. What power supply do I need for the Raspberry Pi 3? The best choice is the official Raspberry Pi Foundation power supply, which is rated at 2.5A5.1V. This is in contrast to the 2A5V-rated supply used by earlier boards. Which is the fastest micro SD card for the Raspberry Pi 3? A particularly fast card in a recent round-up was found to be the SanDisk Extreme PLUS 64GB microSDXC. Be warned, however, that this card costs $58.95, more than the Pi 3 itself. For most users a standard class 4 micro SD card working at 4MB/s should suffice. What size micro SD card do I need for the Raspberry Pi 3? If you're installing the official Raspbian OS you'll need at least an 8GB micro SD card, whereas for the Raspbian Lite you'll need a minimum of 4GB. Can I use Wi-Fi on the Raspberry Pi 3? Yes, the board supports 802.11n Wireless LAN (peak throughput of 150Mbps) and Bluetooth 4.1. Can I run a network of Raspberry Pi 3s? Yes, and managing and updating the boards should be made simpler by the ability to boot from a network-attached file system using PXE, allowing admins to share operating system images between machines. IIn this project we will use the basics of an IR senosr to measure the speed of rotation of a shaft. The idea is to dectect or not the infrared light. Having some sort of reflecting material on the rotating shaft we cold detect a peak of the sensed light and measure the time between those peaks. The measured time is the time that the shaft take to make one full rotation. This project is simple. The total price is under 10 dollars. If you don't have a 3D printer you should create any kind of small case and fit everything in place. So lets see what we need. Ok, so how this RPM meter works. Well, we have a IR LED that will emit light. The light will reflect on the surface of the moving part. The reflected light will then touch the sensitive base of the IR sensor. This IR sensor works exactly like a commune BJT transistor but instead of controlling the current from the collector to the emitter by applying a small current to the base we control the current applying infrared light. 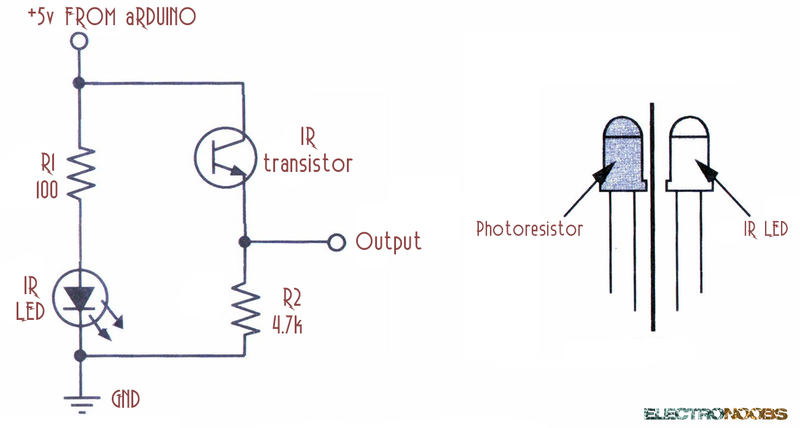 The base of this transistor is exposed to the light and when the infrared wave touches the base, the circuit is open and no current flow through the transistor. But when no light is exposed current could flow. So basically, this is a switch activated by light. So, the detection circuit is something like this. The output will be the emitter of the transistor. We add a pulldown resistor to the output. 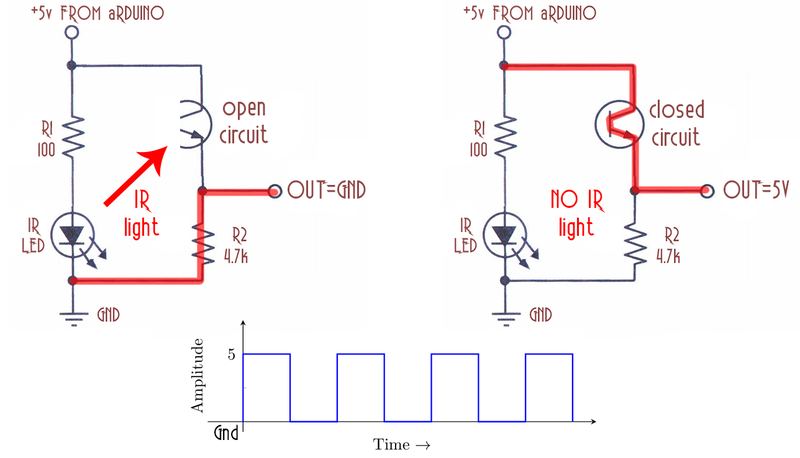 In this way when the circuit is open the output will be ground and when the circuit is closed the output is a high value, in this case 5 volts because that’s the basic voltage of the Arduino. Actually, the output is a voltage divider between the resistance of the transistor and the pulldown. So, the pulldown should have a high value, in this case 4.7 kilo ohm, so when the transistor is conducting, the voltage drop between the collector and emitter should be very small and all the voltage should drop on the pulldown resistor. Next, we should add a small resistor, around 100 ohms to the positive pin of the infrared LED in order to limit the current and not burn it. So just like that we've detected IIR light. So now if I put something white in front of the IR LED and sensor, light will reflect, the circuit will be open and the output will be 0. When I remove the white object, light will no more touch the sensor and once again the output will be 5 volts. Just like that we could obtain a square wave if a spinning object with a white stripe is placed in front of the sensor. If we analyze with the oscilloscope the output signal while the shaft is spinning we can see some errors. The signal is not a perfect square wave and has a sinusoidal shape. In order to improve the signal and obtain a perfect square wave we should use an operational amplifier. I’ve use the LM324 OP amp. 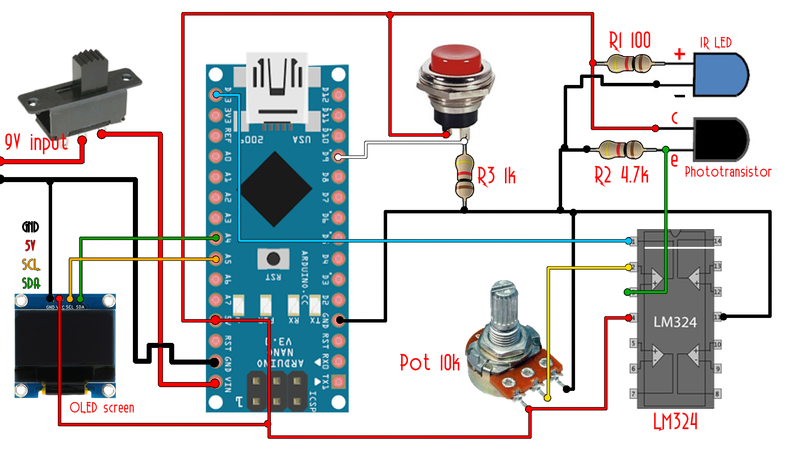 Connect the output from the sensor to the positive input of the OP amp and the negative input to a voltage divider made with a potentiometer. In this way, we could regulate the sensing distance of the sensor depending on the intensity of the light. Ok, as you can see in the schematic above, we have a 9V input from the battery. The slide switch will turn on and off the entire system. Connect the output from the switch to the Vin pin of the arduino. Also connect ground. Next you should supply 5V and connect GND to the OLED screen and the LM324 amplifier. Also connect 5V to the push button. Add a 1k pulldown resistor to the push button. In this way when the button is pressed the D9 input will be high and when the button is released the input will be low. We will use this button to put the arduino in low power mode when not measuring. Add a 100 ohm between the positive pin of the IR LED and 5V. Also connect a 4.7k ohm between the emmiter off the phototransistor and ground. Now connect the emmiter to the positive input of the LM324 OPAMP. Create a voltage divider between 5V and groudn with a potentiometer and connect the middle pin to the negative input of the LM324 amplifier. Using this potentiometer we could adjust the detection distance/intensity. Finally connect the amplifier output to digital pin 13 of the arduino. The circuit is ready. Using this black and white paper I check the functionality. The black color should absorb all the light so no light will reflect into the transistor base so the circuit is still open. When white color is placed in front of the LED, the light reflects and hits the transistor base closing the circuit. So, imagine a white stripe on the exterior of the motor. Each time the stripe pass in front of the sensor we will have 0 volts at the output and 5 volts in the rest of time. Ok, I've used a 3D printed case. You have the download link with the STL belwo. Download it and print the parts using 2 perimeters adn 20% infill. I've used my Anet A8 printer and a 0.3mm nozzle. 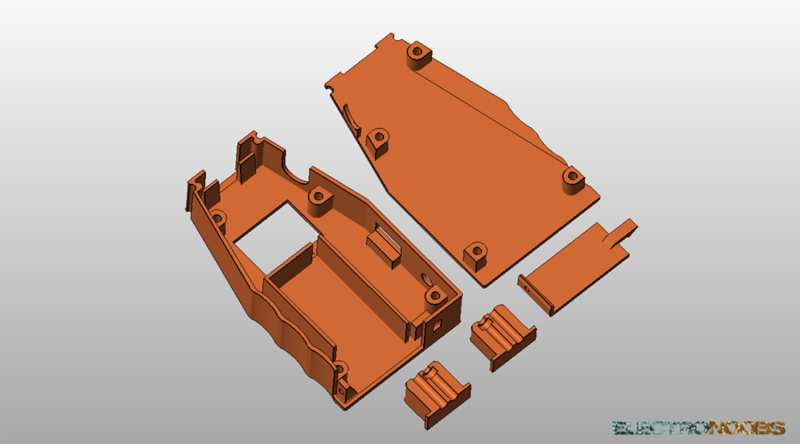 Use support material for the parts with the (use_support) file name. Now that we have the case we have to program the Arduino. For that you first need to download the next two libraries for the OLED screen. 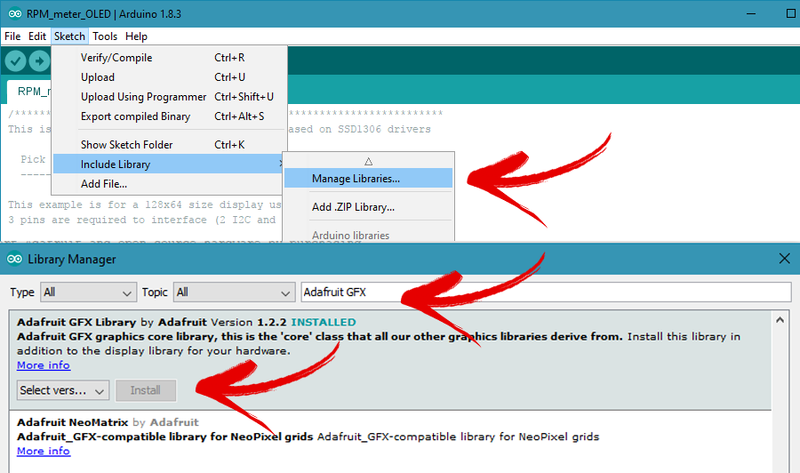 Download them from the next link or install them using the library manager in the Arduino IDE. Or you could just install the libraries using the Arduino IDE. For that go to Sketch, include library, library managesr and search for your desired library. Once found, select the version and click install just as in the picture below. The code is simple. When the push button is pressed, the meter is activated. We know that the LM324 will give us a low pulse each time the white stripe pases in front of the sensor representing one full rotation. We have to start a counter when we detect the first positive edge representing the final of the white stripe and count the time till we detect another positive pulse, representing the start of the white stripe again. We make the difference of the measure counters and we obtain the time for one rotation in microseconds. We divide one minute (60.000.000us) by that value and we obtain the rotations per minute. We print the value to the OLED screen uisng the text function. When the push button is released the Arduino will be in low power mode. You could turn it off with the slide switch as well. First we include all the libraries. Remember to download the liblaries above. Now that we have the libraries we define the vareiables and start the Setup loop. 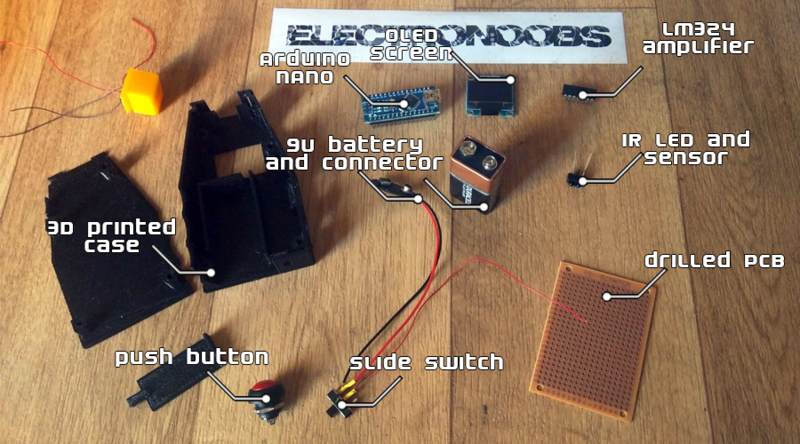 In the Setup loop we start the OLED screen, define the pins as inputs and print the electronoobs LOGO. Be careful, the i2c adress in my case is 0x3C in the display.begin function in the Setup void. If you don't knwo the i2c adress of your module use the next code to find it. Download the sketch. Upload it to your arduino. Connect the SCD and SDA pins and open the Arduino monitor. Select 9600 baudrate. The i2c adress will be printed on the monitor.